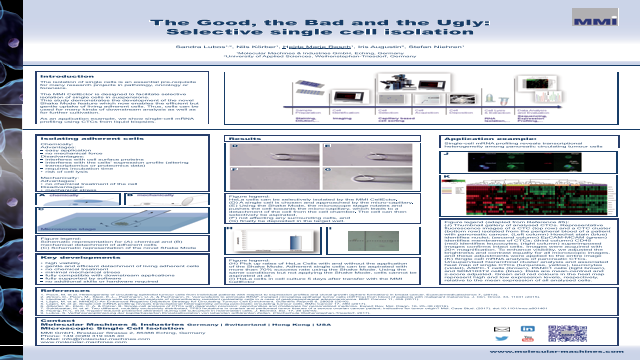 Abstract: The isolation of single cells is an essential pre-requisite for many research projects in pathology, oncology or forensics. The MMI CellEctor is designed to facilitate selective isolation of single cells in suspensions. This study demonstrates the development of the novel Shake Mode feature which now enables the effi cient but gentle uptake of living adherent cells. Thus, cells can be used for many kinds of downstream analysis as well as for further cultivation. As an application example, we show single-cell mRNA profi ling using CTCs from liquid biopsies.Summary: A smart way to efficiently isolate single living and adherent cellsReferences: 1. Pizon, M. et al. Heterogeneity of circulating epithelial tumour cells from individual patients with respect to expression profi les and clonal growth (sphere formation) in breast cancer. Ecancermedicalscience 7, (2013). 2. Zimon, D., Pizon, M., Stein, E.-L., Pachmann, U. A. & Pachmann, K. Vemurafenib to eliminate BRAF-mutated circulating epithelial tumor cells (CETCs) from blood of patients with malignant melanoma. J. Clin. Oncol. 33, 11031 (2015). 3. Hjortland, G. O. et al. Genome wide single cell analysis of chemotherapy resistant metastatic cells in a case of gastroesophageal adenocarcinoma. BMC Cancer 11, 455 (2011). 4. Lapin, M. et al. MINDEC-An Enhanced Negative Depletion Strategy for Circulating Tumour Cell Enrichment. Scientifi c Reports 6, 28929 (2016). 5. Lapin, M. et al. Single-cell mRNA profi ling reveals transcriptional heterogeneity among pancreatic circulating tumour cells. BMC Cancer 17, 390 (2017).